JUDAEA. The Jewish War (AD 66-70). AR shekel (23mm, 13.69 gm, 12h). 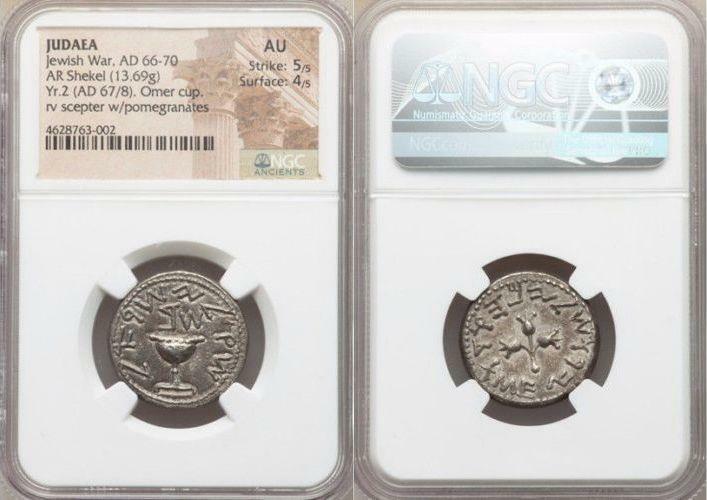 NGC AU 5/5 - 4/5. Jerusalem, dated Year 2 (AD 67/8). Shekel of Israel (Paleo-Hebrew), Omer cup (ritual chalice) with pearled rim, the base resting on raised projections; Year 2 (Paleo-Hebrew) above / Jerusalem the holy (Paleo-Hebrew) around staff with three pomegranate buds, with globular base. Hendin 1358. TJC 193. Well-centered and struck with subtle luster on deeply-toned surfaces. After decades of abuses heaped by the Romans upon the denizens of Judaea, the Jews were ripe for revolt. In AD 66, the Procurator Gessius Florus summarily seized 16 talents of silver from the Jerusalem temple. A massive protest by the citizens brought a typically brutal Roman response and more than 3,000 Jews were slain. Pleas for calm by the client King Agrippa II fell on deaf ears as the city and countryside rose in full-scale revolt. Florus and the Roman garrison were driven from the city; an attempt by the legate of nearby Syria to put down the rebellion led to the loss of an entire Legion, XII Fulminata, and consternation in Rome. Once freed of the Romans, Jerusalem temple authorities began striking their own silver coinage, the first time that a sovereign Jewish government had done so. The coins carried Jewish symbolism dating back centuries and slogans ("For the Freedom of Jerusalem," "For the Redemption of Zion") that showed the leaders of the rebellion well understood how to use coins for mass communication. Workmanship in the manufacture of these thick shekels and half-shekels (smaller silver fractions were also struck in tiny numbers) was unusually high, given the wartime conditions under which they were created. Coins were dated to the year the revolt started and examples exist dated years one through five. JUDAEA, Procurators. Porcius Festus. 59-62 CE. Æ Prutah (16.86mm, 2.09g). Jerusalem mint. EGYPT, Alexandria. Antoninus Pius. 138-161 AD. Billon Tetradrachm (23mm, 11.79 gm).